Contents March 2019 - STOP Think! Asbestos Surveys – Do not be exposed to the hidden killer! Introduction March 2019 - STOP Think! I recently attended the second part of our STOP Think! Refresher Programme. For me STOP Think! was never just about safety. 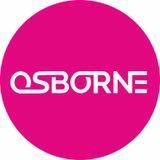 It is a cultural development programme that is centred on the learning that will deliver the cultural change needed to grow our business in a safe and sustainable way and the content reflects this wider cultural change that we are aspiring to within Osborne. We recognise the importance of governance and assurance as we grow, and the need for increased levels of data to enable us to make better business decisions across a wider range of customer portfolios in a consistent manner. We also recognise the criticality of truly engaging a diverse workforce to help us deliver our goals, gaining a true sense of collective commitment to a common cause, with everyone taking full accountability for their own actions; holding themselves and their colleagues to account. STOP Think! Moments March 2019 - STOP Think! Asbestos Surveys â&#x20AC;&#x201C; Do not be exposed to the hidden killer! Learning March 2019 - STOP Think! Horley Station 2018 - During the removal of short circuit straps the COSS stepped onto an open line. Thankfully he was able to get our of the way of an approaching train as the driver applied the emergency brakes. In November 2018, a track worker was killed at Stoats Nest Junction when he was struck by a passenger train. Prior to this incident, it had been nearly five years since a track worker had been struck and killed by a train. Catford Station 2013 – Seven colleagues mistakenly accessed an open line believing it was blocked. Ascot Station 2017 - Two colleagues were on the line when a fast train approached; thankfully they managed to scramble clear. Miscommunication led the COSS to mistakenly believe a line blockage was in place. iGO Learning Drop-inSessions Are you struggling to get to grips with iGO? These requirements are to be implemented immediately on all IP Southern region sites. Please amend by hand any copies of the Charter you may hold. The amended Charter will be re-issued shortly. Road Worker Protection Safety Cameras for A1 Intrusive Surveys Our team working on the A1 Intrusive Surveys Project have recently introduced the use of a Safety Camera Van “SAFETYcam” to help keep their workers safe. Following a number of vehicle incursions and also vehicles speeding past the works area, the team are hoping that “SAFETYcam” will provide a conspicuous visual deterrent that will help to change driver behaviour and reduce the exposure of our people to the hazards associated with traffic. This move has been well received by our workforce and our suppliers. “SAFETYcam” is a mobile road worker protection system that is available through Carnell. The comprehensive system fuses image, video and Automatic Number Plate Recognition technology with state of the art processing and reporting techniques. It uses a two camera system to report on vehicle speeds and dangerous driving, whilst also providing footage of unauthorised vehicle incursions. A Safety Report is produced within 12 hours of the end of each shift. SAFETYcam First Convictions As reported by Safer Highways last month, Police have now confirmed that two drivers have recently been convicted of motoring offences following incursions into road works that were captured by Carnellâ&#x20AC;&#x2122;s award winning SAFETYcam mobile road worker protection system. Both received a fine and penalty points on their license. Safer Highways Wellbeing Strategy The purpose of the Safer Highways collaborative programme is to keep health, safety and wellbeing at the fore of the highways industry. It is supported by industry leaders and world experts who help drive awareness, strong leadership, effective communication and best practice at all levels in our sector. SAFETYcam vehicles are becoming more widely used across the country, with more than a hundred evidence files having now been prepared by the SAFETYcam teams and passed to the relevant authorities. Indeed extensive trials using SAFETYcam are showing a significant reduction in vehicle incursions and a noticeable increase in traffic compliance with road works speed limits. SAFETYcam ensures that drivers remain fully focussed and alert when travelling past road works sites and reduces both intentional and accidental incursions. their “Road to Better Wellbeing” Framework which is being launched at the House of Commons, London in June this year. ecological requirements will affect your project and potentially your programme of works. The Road to Wellbeing is a set of ideals for delivering Occupational health within the Highways Sector. The ideals are taken from the Mind Workplace Wellbeing Index, of which Osborne is a member, and many organisations will already be familiar with. Sharing March 2019 - STOP Think! After three years in the planning, works at Feltham Station are progressing well. The existing “Exmouth” type bridge has now been demolished and the team are now preparing to remove the cycle bridge and install the temporary footbridge. This challenging bridge removal was safely and successfully completed during a meticulously planned weekend possession despite restrictions in space, proximity of other properties and public interfaces. Thank you to all the team for your delivery of this milestone activity. Well done to all, including our Suppliers For your dedication and commitment to the safe delivery of this challenging project. Canal Opened a Week Early at Durrants Hill At Durrants Hill Canal Bridge our team have completed top quality painting works to a canal bridge ahead of programme. This has allowed the scaffolding to be stripped and the canal and towpath to be opened a week earlier than planned much to the delight of the boat owners. Minimal Motorway Disruption at Romsey As our team successfully hit milestones in the construction of the new Romsey Road Bridge, the travelling public are blissfully unaware due to the meticulously planned off-line construction techniques! Works are continuing at pace with abutment piling, culvert diversion works and the new bridge deck under construction. With overhead power cables, height and slew restrictors and works only a couple of metres from Lane 1 of the M27 this is no mean feat! To open the canal one week earlier than the five week allowable closure duration was no mean feat in this environmentally sensitive area. With the original paint being lead based and the bridge being located over a navigable canal the structure had to be fully encapsulated and include a comprehensive extraction and temperature control system before work could begin; culminating in grit blasting, priming and painting of the beams, and each of the 8000 rivets being painstakingly painted by hand! Thank you to all involved! Including our specialist suppliers EA Scaffolding, Wood, Hall and Heward, Southern Coatings and Barao. For your excellent work in completing this time critical project early whilst delivering a top quality product. A fantastic effort by the site team and our specialist suppliers working together to deliver a successful outcome for our customer. metres of concrete onto the pre-assembled steel beams. For the cradle to grave management of our SWP/track access planning and resourcing system, the best the Auditor has come across! For our Safety Critical Staff supplier tender and selection process. For our safety critical equipment audits carried out and recorded during T3 possessions and line blockages. The team are currently working on the construction of the cantilevered parapets in preparation for “driving” the new bridge into its final position over the motorway using SelfPropelled Modular Transporters. This will be during the next weekend closure of the M27 Motorway at the end of June 2019. Thank you ALL For your continued hard work, detailed planning, and comprehensive stakeholder engagement as we continue towards the next major milestone of installing the new bridge during a second closure of the motorway! This fantastic result reflects the hard work of the Rail Assurance Team led by Daren Norris, ably supported by many people from across the business. Well done to ALL involved and many thanks for your help in delivering this outstanding performance. We are very pleased to say that following our Railway Industry Supplier Qualification Scheme (RISQS) Link-up audit, we have maintained our long standing maximum possible score of five stars. Gold Rated Sites - Period 11 Congratulations to our teams working at Ewell West Station and Feltham Station Combined Upgrade Scheme. Both sites received the Period 11 “GOLD” rating from Network Rail with Ewell West Station Access for All Scheme also achieving the top scoring site in the Wessex Route. Their scheme is not only worthy from an environmental point of view – but also demonstrates great Corporate Social Responsibility as clearly seen in their recently published Social and Environmental Impact Report for 2018, as included overleaf. Their invaluable work provides life-changing opportunities for disadvantaged people to gain the skills and confidence they need to get back into the workforce, saves precious resources and reduces carbon emissions to help fight climate change. How did we do? Across Osborne we disposed of 535 tonnes of timber between January and December 2018. As seen in our Impact Report - Community Wood Recycling were only invited to collect 67.8 tonnes. These awards are only awarded to the best projects across IP Southern so a massive well done to all involved. Social and Environmental Benefits - Community Wood Recycling To enhance the potential of waste recycling and reuse, several of our sites continue to engage with “Community Wood Recycling,” a voluntary organisation who take waste wood from sites at cheaper rates than having a skip and reuse/recycle the timber waste into other wood products. If all 535 tonnes had been collected by Community Wood Recycling we could have saved in the region of £15,000 and also could have avoided an additional 230 tonnes or more of CO2 being emitted into the atmosphere. Our partnership with “Community Wood Recycling” not only helps to preserve resources, but also provides opportunities to contribute to a fairer, healthier and more inclusive society. On average the construction industry across Europe produces 198,000 tonnes of plastic waste. 25% of construction packaging waste by weight is plastic, of which only 85,000 tonnes is recycled. Do we know where plastic is being produced on our sites? Can we specify alternative (recyclable) packaging for the materials delivered to site? If the packaging is to protect materials from the weather – can we find alternative ways? 99% of all plastics are produced from non-renewable resources. 50% of all plastic produced is designed as single-use. 300 million tonnes of plastic waste is produced every year. 60% of that plastic has ended up in either a landfill or the natural environment. 8 million tonnes of plastic end up in the world’s oceans every year. By 2050 our oceans could contain more plastic than fish! Health & Wellbeing March 2019 - STOP Think! Past occupational exposure to known and probable carcinogens is estimated to account for about 5% of cancer deaths. The construction industry has the largest estimate of occupational cancer cases, with about 3,500 cancer deaths and 5,500 cancer registrations each year from the industry. Macmillan Cancer Information Marie Curie Cancer is caused by damage to our DNA, the chemical instructions that tell our cells what to do. Things we come into contact with in our environment, such as UV rays, or through our lifestyle, such as the cancercausing chemicals in tobacco, can damage our DNA. Every year, more than 350,000 people are diagnosed with cancer. In the UK, more than 1 in 2 people will develop cancer at some point in their lives. But experts estimate that only about 2 or 3 in every 100 cancer cases are linked to inherited gene faults. Surprisingly, many studies have shown that people aren’t necessarily aware that all of these things can be linked to cancer. Three quarters of people are not aware that obesity can be one of the causes of cancer. Even more do not know of the scientific link between alcohol and cancer. Worldwide, one in five of alcoholrelated deaths are caused by cancer. Just one alcoholic drink a day can increase the risk of developing cancer and the risk increases with every drink. This lack of knowledge about the relationship between alcohol and cancer constitutes a significant health risk. There is no “safe” level of alcohol consumption when seeking to reduce the risks of certain cancers. National No Smoking Day 13 March 2019 No Smoking Day is an annual health awareness day in the United Kingdom which is intended to help smokers who want to quit smoking. Over the last few decades, it has become very clear just how dangerous smoking is, due to the toxins that cause many different forms of cancer from the mouth to the lungs. So why not take the opportunity to choose to quit? It will improve your health within days of stopping. Remove any Reminders Before your quit date, get rid of ashtrays, lighters, and any remaining cigarettes. 5. Use “Stop Smoking Services” Contact your local NHS Stop Smoking Service for support from trained specialists. 6. Try Nicotine Replacement Therapy Consider using nicotine replacement therapy, which can more than double your chances of stopping smoking. 7. Start Moving As little as a five minute walk can reduce the urge to smoke. 8. Avoid Trigger Situations Anticipate stressful or trigger situations. 9. Practise saying “NO” Don’t be tempted - just one cigarette often leads to another. 10. Treat Yourself Put away some of the money you would have spent on cigarettes and buy something special. 10 Steps to Stopping Smoking Stopping smoking isn't easy, but there are things you can do to improve your chances of success. 1. Pick a Quit Date Choose a day that will be stress-free, and stick to it. Make a List Write down all the reasons you want to quit and read it when the cravings start. Build a Support Network Pair up with someone else who’s looking to give up and support each other. Salt Awareness Whilst salt (sodium) plays an important part of a healthy diet, consuming too much salt can be bad for your health and has also been linked to an increased risk of high blood pressure. The problem with high blood pressure is that it rarely has noticeable symptoms and, if left untreated, it increases your risk of heart attacks and strokes. It is recommended that we eat less than 6g of salt per day but approximately 75% of our daily salt intake is hidden in foods we eat. This includes anything processed, including meats, bread and bakery products, dairy products, sauces and spreads. Foods that contain salt do not necessarily taste salty. 6 Ways to 6g! -Tips to reduce your salt intake Foods that contain less salt can taste just as good and after 3 weeks or so, your taste buds will adapt and you will get the same flavour sensation with less salt. Health & Wellbeing Calendar 2019 – Reminder Don’t forget to visit our interactive Health & Wellbeing Calendar each month:Health & Wellbeing Calendar 2019 It provides a wealth of information on specific health and wellbeing topics and includes Toolbox Talks, useful websites, videos and posters. 1. Try seasoning with herbs, spices and citrus rather than adding salt. 2. Understand food labels to monitor salt in the foods you buy. 3. Make use of Apps – If you aren’t sure about the salt (or sodium) volume in a food item and it doesn’t have a traffic light system then use a phone app to help you. What Good Looks Like March 2019 - STOP Think! Milestone Success with Safety at the Fore Ewell West Access for All Scheme Enormous congratulations to our team at Ewell West Station who recently delivered a highly significant milestone on the construction of the Access for All Scheme despite temperatures dropping to -4oC! Within a 6 hour possession the team installed the two steel lift shafts and canopies using a 100 tonne crane. Installation of the lift shafts was crucial to programme, but the team did not let the pressure affect their commitment to putting safety first. The site and methods were “text-book” with numerous examples of best practice as pictured. Thank to everyone involved for your absolute commitment and for putting safety first at all times; despite enormous pressures and challenges and not to mention the extreme weather! What Good Feels Like March 2019 - STOP Think! Harnessing Talent within our Communities Slough Aspire two day Career Fair Thank you to Dominic Lowry who along with Rakesh Kripalani supported the Slough Aspire Careers Fair, taking the opportunity to once again showcase our Virtual Reality capability to the next generation of budding engineers and helping them to consider study choices. At the end of the two day fair, 2000 Slough young people from 16 schools would have had the opportunity to visit and engage with the variety of supporting companies including Barclays, Mars, BAE, the NHS, RAF and many more! Great to see representatives from Property Services and Infrastructure working together in support of such important events as One Osborne; promoting our depth and breadth of skills in the provision of service-led solutions that go beyond the physical build. Tenant Academy – Brick Laying Workshop Property Services and Infrastructure came together once again to host the 8th Tenant Academy Workshop. Local residents came to the training centre to gain experience of brick laying under the guidance of Sarah Askey and Jon Millar from Osborne and Dean Lowes from AW Rail Ltd. AW Rail Services Ltd very kindly provided the tools, materials and a very experienced and excellent Trainer, Dean, who showed the attendees how to lay bricks, use the tools correctly, mix mortar and build a small wall in the demonstration area. The day was really engaging with the attendees thoroughly enjoying the session and learning fast! Thank you to Sarah, Jon and Dean for supporting our communities with such valuable initiatives. Thank You All - for your superb engagement to raise awareness on the varied and challenging opportunities we can offer as an industry. 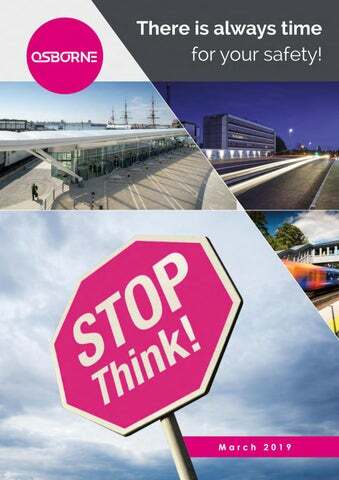 Safety Statistics March 2019 - STOP Think! customers so their importance really must not be underestimated. So please – let’s all get on top of reviewing and closing our IO’s on a daily basis to make sure that an important idea is not missed. On a normal day, we receive an average of 20 IOs. Before the IO Action Day, our busiest day for IO submissions in the last 12 months was 79 raised. That’s an impressive increase of 600% over the average day. The Infrastructure IO Panel reviews every Improvement Opportunity submitted each month. A favourite Improvement Opportunity from the January 2019 IO Panel was raised by Thomas Glenn regarding his actions to prevent a potentially serious incident. 492 IOs changed status for the better on 12 February 19. 16% of previously Open IOs are now closed. 8% of previously Propose Closure IOs are now closed. Whilst driving to work Thomas noticed that a Network Rail pedestrian access gate was wide open. The gate was opposite a park where members of the public walk with children and dogs. Upon closer inspection, Thomas realised that the Network Rail padlock had been cut off and an attempted theft of cables had taken place. A temporary padlock was immediately placed on the gate and the issue raised with the Network Rail Maintenance Team to reinstate the proper padlock and check for further damage. Thank you Thomas For your swift actions to ensure the safety of all and protection of the rail network. February IO Statistics During the month of February, whilst the level of engagement with the IO System was helped by our IO Action Day, unfortunately this energy did not continue throughout the month and we actually ended February with a lower figure than at this time last year. Thank you for your continued engagement and please let’s make every day an IO Action day. Please do continue to submit your IOs on doing things differently and innovations; helping us to embed our learning culture and to continuously improve. Tool Box Talks March 2019 - STOP Think! External Alerts March 2019 - STOP Think! STOP Think! about… March 2019 - STOP Think! Key Points for March • Working Responsibly  STOP Think! Moment – Welding Fume and Cancer. HSE are strengthening their approach where exposure to welding fume is not properly controlled. Control exposure, provide suitable RPE, update risk assessments and monitor all activities.  STOP Think! Moment – Asbestos Surveys. Always assess whether asbestos is likely to be present. Carry out appropriate surveys and remove before any major refurbishment or demolition works. Ensure all workers are trained for Asbestos Awareness.  STOP Think! Moment – Occupational Close Call. A team accessed the rail infrastructure with potential to be struck by a train. Do not go onto the operational railway without the correct protection in place. • Slips, Trips and Falls  STOP Think! Moment – Shoulder dislocation moving hose to a safer position. External Alert – Broken Elbow tripping down stairs. Plan site working arrangements to avoid creating hazards for others. Ensure suitable pedestrian segregation is in place. Don’t rush. Ensure all pre-existing medical conditions are reported to your Line Manager. • It Won’t Happen Here Campaign  This national Network Rail Campaign has been launched to challenge the belief that it’s only others that are unsafe, that near misses could never happen to us and to open up a discussion on what action we need to take to make sure that near misses Won’t Happen Here. • Heath & Wellbeing  Cancer Awareness – March Prostate and Ovarian Cancer Awareness Month.  National No Smoking Day - 13 March 2019. • Environmental and Sustainability  Community Wood Recycling – For social and environmental benefits do consider using Community Wood Recycling to take your waste wood from your sites at a cheaper rate than having a skip!  Bird Nesting Season – It is illegal to kill or disturb birds or damage their nest or eggs. Carry out a survey before all works start and stop all works in the immediate area. • REMEMBER…  Track Access Protocol Changes – Due to changes to the Rule Book requirements for line blockages the Southern Shield Track Access Protocol has been updated.  Conquip Boat Skip Recall – All Conquip Boat Skips (CA122 – 03000) should be returned to Conquip Engineering Group for remedial work.